Americans are celebrating July 4th this year by attending more baseball games, rock concerts and Broadway plays than last year, according to Marta Ault at online discount ticket marketplace BuyAnySeat.com. Current ticket sales leaders include Mötley Crüe and Alice Cooper, Luke Bryan, Jay Z and Beyoncé, and Kiss and Def Leppard, while top theatre choices are The Lion King, Wicked, Disney On Ice: Frozen and The Book of Mormon. Hey, it's the 4th of July already. You know, America's birthday. In addition to all of the fireworks and barbecues this year, Americans are also celebrating by getting out a bit more than last year. In fact, according to Marta Ault at online discount ticket marketplace BuyAnySeat.com, ticket search and sales volume is running slightly ahead of 2013's traffic. “In addition to the concert and theatre ticket leaders, MLB Baseball is currently ahead of all other paid sports events in ticket search and sales activity online,” said Ault. “Soccer tickets are also trending extremely high and we are beginning to see an uptick in NFL sales with several teams starting to release tickets to the upcoming season as well. “To access the full line-up of cheap concert, sports and theatre tickets now available, including all of the seating options offered at each venue, customers can go to BuyAnySeat.com and select their tickets." Independence Day, aka the Fourth of July, is the National Day of the United States. As a federal holiday, it marks the day, July 4, 1776, that the patriots of America adopted the Declaration of Independence to separate from the Kingdom of Great Britain. 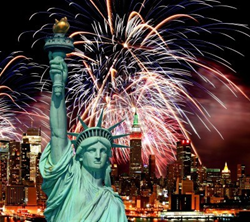 Today, Independence Day is typically associated with fireworks, parades, barbecues, carnivals, fairs, picnics, concerts, baseball games and family reunions. In addition, the day is marked by political speeches and ceremonies along with various other public and private events celebrating the history, government, and traditions of the United States. To shop for discount, concert, sports and theatre tickets, visit BuyAnySeat.com. To save even more, enter coupon code "BAS2014" at checkout.